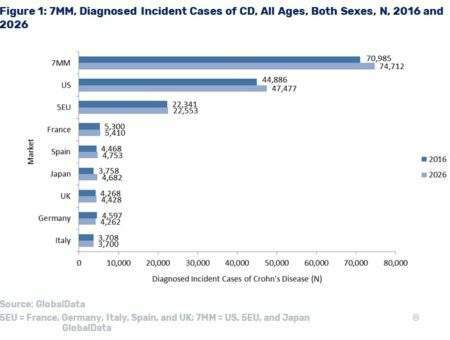 The burden of diagnosed Crohn’s disease (CD) is expected to grow between 2016 and 2026 in the seven major markets (7MM: US, France, Germany, Italy, Spain, UK, and Japan). GlobalData epidemiologists forecast an increase in the number of diagnosed incident cases, most notably in the US and Japan. Figure 1 presents the expected changes in the 7MM from 2016 to 2026. CD is an inflammatory bowel disease (IBD) characterized by chronic inflammation of the gastrointestinal tract. While any part of the gastrointestinal tract can be affected, inflammation is most commonly found at the end of the small intestine (ileum), and the start of the large intestine (colon). The disease course of CD is characterized by periods of remission followed by periods of relapse, the length and severity of which differ from case to case. Inflammation in CD can result in severe scarring and narrowing of parts of the bowel. There is no cure for CD, and treatment aims to control symptoms and sustain remission; it is estimated that up to three quarters of those with CD require surgery. The disease can lead to premature mortality, disability, and decreased quality of life. In the 7MM, GlobalData epidemiologists forecast that the diagnosed incident cases of CD will increase from 70,985 cases in 2016 to 74,712 cases in 2026, at an Annual Growth Rate (AGR) of 0.53%. In 2016, the US accounted for 63.23% of the diagnosed incident cases of CD. The US is expected to have the highest number of diagnosed incident cases of CD among the 7MM throughout the forecast period, while Italy will have the lowest. The above data are based on a base forecast that used literature values where there was lack of temporal data to trend for certain markets. However, GlobalData epidemiologists believe the lack of temporal data is a data gap, and that in reality, incidence would be likely to increase based on findings from primary research and from analysis of global trends. Therefore, an alternate forecast of diagnosed incident cases of CD is also provided for the US and the 5EU markets to estimate the patient size if trending was applied. The increase in incident cases in the alternate forecast is even greater than the main forecast for each market included. GlobalData epidemiologists estimate the US would see an increase of CD incident cases to 65,023 cases in 2026, and the 5EU will see an increase to 35,992 cases in 2026. Details about the trend analysis and other discussions of Crohn’s disease epidemiology can be found in the EpiCast Report: Crohn’s Disease – Epidemiology Forecast to 2026 and the EpiCast Model: Crohn’s Disease – Epidemiology Forecast to 2026.